manufactured by the Brandtjen & Kluge Company of St. Paul, Minnesota - developers in 1919 of the first commercially feasible automatic feeder for a platen press. We don't really have much on the Kluge Presses - we never operated one and don't have one in the collection. However, as Chandler & Price's main rival for many years, the Kluge is an important press to discuss and support. And, good news for C&P owners, some of the Kluge parts will fit on the C&P. For example, the Gripper Bolts sold for the Kluge will fit on the C&P - and you can buy them new from Dale Prudhomme. Kluge Feeders were very popular - favored by many above the Rice Feeder supplied by C&P - and were often mounted on Chandler & Price presses. 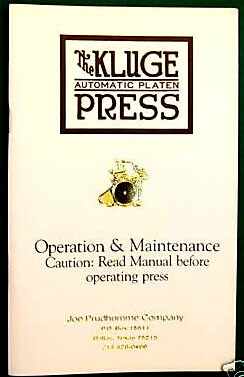 We welcome any additional information or links about the Kluge Platen Presses. Please contact us if you have any information to share - or if you own and/or operate a Kluge yourself.